Mini Caramel Apple Cupcake Toppers | Bring out the party hats and celebrate with these super easy treats! 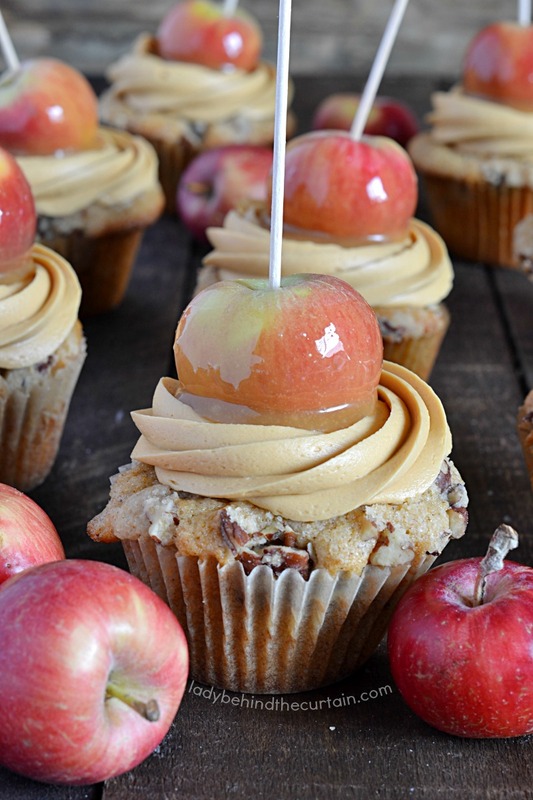 Make them as cute Mini Caramel Apple Cupcake Toppers or as a mini treat! The perfect addition to a carnival themed party. Drop one of these cute little treasures in a treat bag for a great party favor idea! Whichever way you choose to serve them no one can deny how amazing a crispy juicy apple encased in a easy semi homemade caramel tastes! That’s right you don’t have to make your own caramel! All you need is apples, Kraft caramels and a little water! Don’t worry if you can’t find the mini apples (I found mine at Whole Foods)! 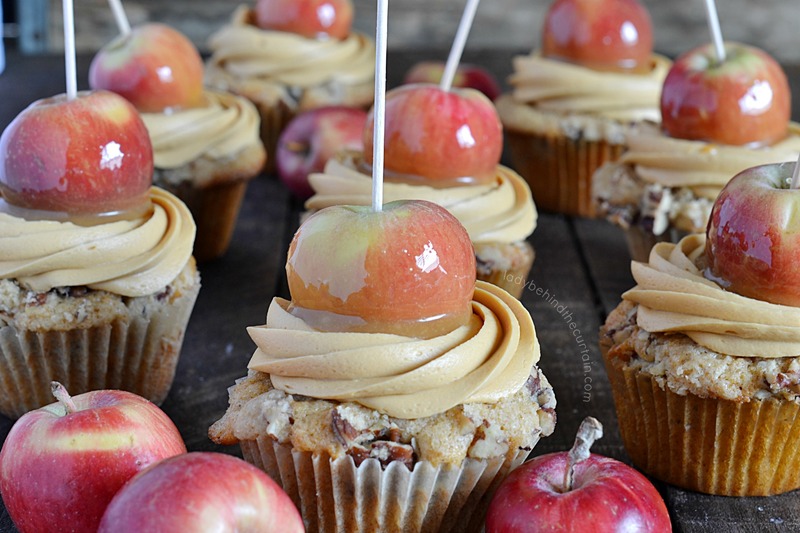 Scroll down to see how you can still create these fun Mini Caramel Apple Cupcake Toppers by using a full size apple (the apples I used were Crisp Crimson Gold Apples)! We’ve all seen the GIANT caramel apples that are in every candy case. While I kept the caramel apples simple (with no toppings) you have the chance to create your own masterpiece in mini form and add your favorite toppings! Another great thing about this caramel……IT DOESN’T STICK TO YOUR TEETH! WooHoo! That’s a win for sure! 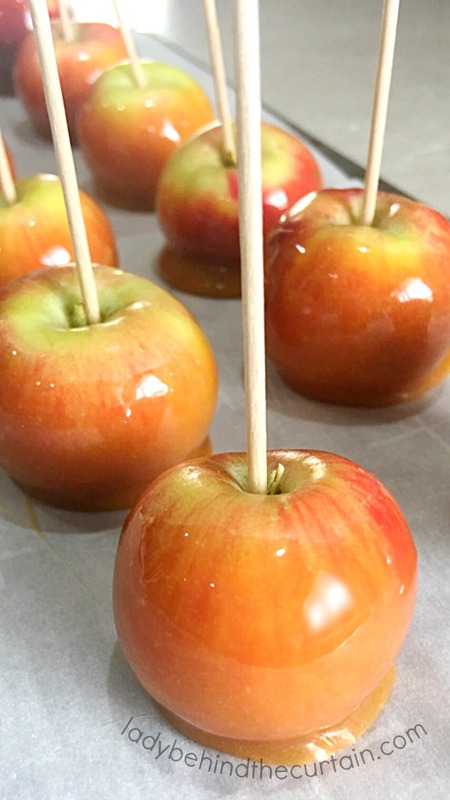 Click here for more fun caramel apple recipes—->>>>CARAMEL APPLE CANDY CORN RICE KRISPY TREATS, CANDY CORN CARAMEL APPLES and OLD FASHIONED CARAMEL APPLES. So….so….sorry I don’t have pictures for this. The idea was an after thought. Hopefully I can explain it clear enough that you won’t need pictures to understand. 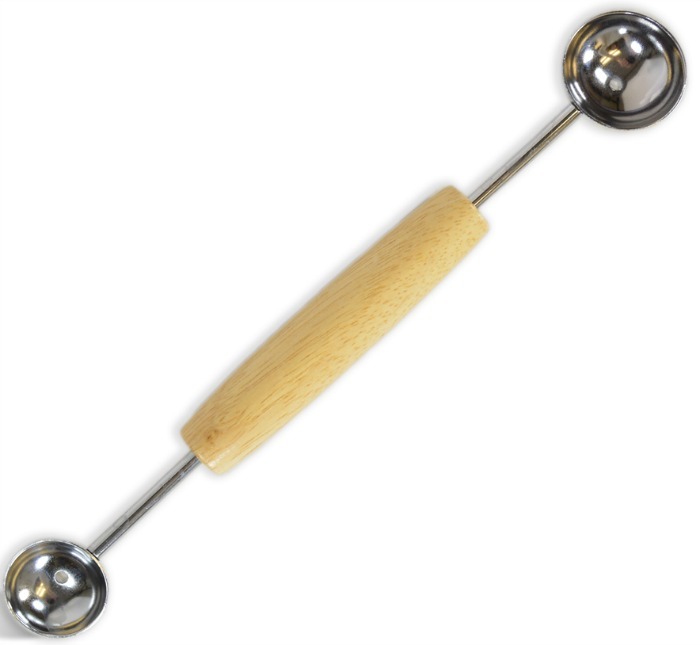 The only difference between the mini apple version is a melon baller (pictured below) and a full size apple. Dip the melon baller (larger end) deep into the apple and twist to cut out the apple, place to the side. Repeat until there is no more space left of the apple. To continue follow the directions for the mini caramel apples. Unwrap all the caramels, place them in a microwave save container ( I used a Pyrex 4 cup measuring cup) with the water. Microwave at full power for 30 seconds, stir, another full power for 30 seconds, stir. Place back in the microwave at 50% for 30 seconds, stir and final 30 seconds at 50%. The caramel should be melted and ready for the apples. Skewer each apple with the extra long toothpicks or lollipop sticks. Dip into melted caramel, clean most of the caramel off the bottom and place on a cookie sheet lined with parchment paper. 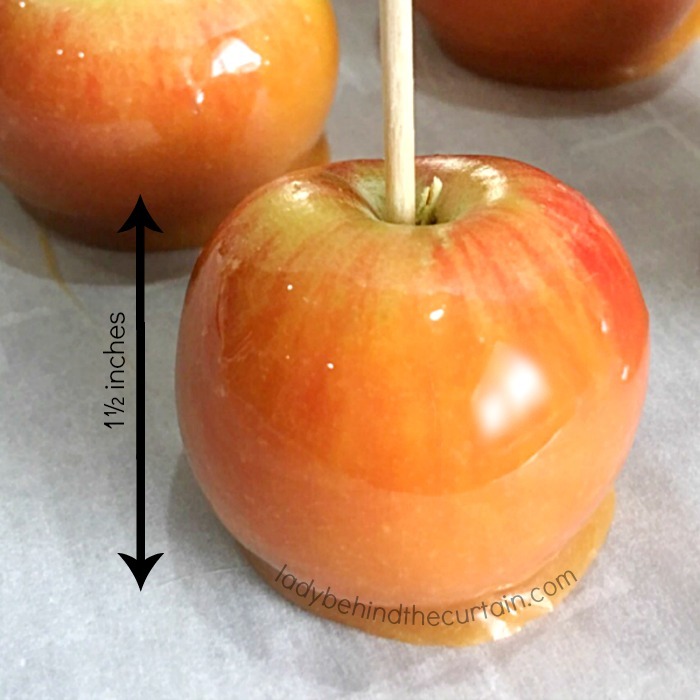 Once all the apples have been dipped there should be enough caramel left so that the apples can be double dipped. Whether you choose to double dip or not I recommend removing the apples and placing them on a clean piece of parchment paper. 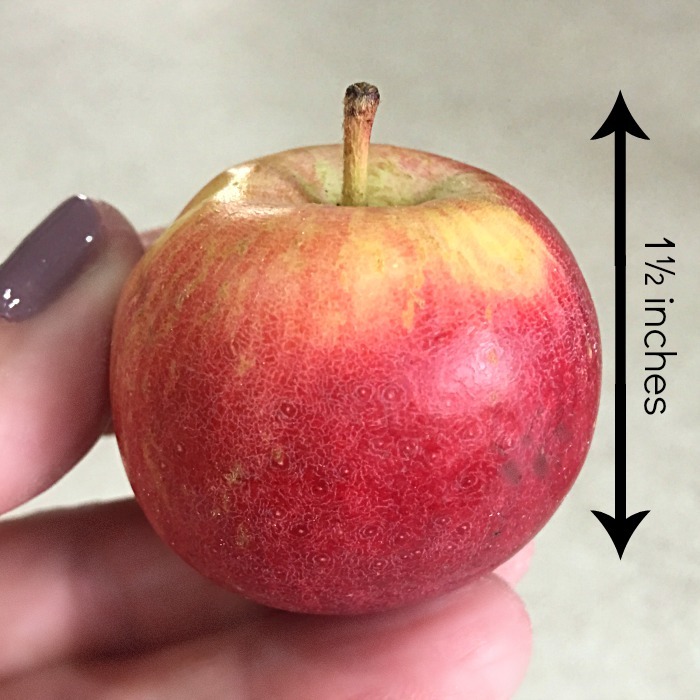 The only difference between the mini apple version is a melon baller (pictured in the post) and a full size apple. Dip the melon baller (larger end) deep into the apple and twist to cut out the apple, place to the side. Repeat until there is no more space left of the apple. To continue follow the directions for the mini caramel apples. More cupcake topper ideas you might like. CHOCOLATE CHRISTMAS TREES and EDIBLE PALM TREES.